Today we woke up at 4AM so that we could get everything together and be out the door for the East Coast. Well, I’m not quite what you would call a morning person. I move…mmmm… what’s another word for slow? Snail speed, ah yes! Lets go with that. I’ll be the first to admit, I was the cause of our lateness today. Oops..sorry Mr. B. Once we got to the Rest stop to meet up with our group, I decided on my first ever grown up drink. Coffee! What were you thinking? Again, much to early for anything else. I ordered a Carmel macchiato. I have had a few sips here or there from the coffee aficionado, Mr. B, but never my own full cup. Growing up my family never enjoyed or appreciated a good cup of joe. The fresh brew just wasn’t part of our morning routines. I always thought of coffee as the crazy man’s drink. You drink it, you get hooked, you can’t function in the morning without it, repeat routine. I assume this is why I too never got excited for the stuff. Well, whatever the case, today marked an adult milestone for me. Did I cross over? Does this mean, I too am finally a “grown up”? Look out Mr. B! We got back on the road fairly quick and departed for the coast. Once we arrived, Mr. B set up his scuba gear, while I parked it on a beachfront park bench and Skyped with my grandparents. If you couldn’t guess…my bliss involves my two feet on land and my camera. Hope you had a blissful Saturday afternoon too! Diving…. You read that correctly. Yes, we are aware it is the beginning of January and it is indeed very cold out. Mr. B and his friends decided they were going to bring in the New Year right, scuba diving of course! This was my first time ever tagging along on a dive weekend. I think mostly because a typical dive week starts at 3 or 4 AM on a Saturday morning and doesn’t end until late Sunday night. I love my sleep way too much to pry myself out of the warmth of my big comfy bed. Mr. B took it easy on me this time. Well…sort of. We didn’t wake up until 5 AM, and didn’t leave the house until 6:30 AM. Hey! I will take all the spare minutes I can have to sleep in. We hit the road bright and early. It was really nice getting to see new parts of Korea! I was really excited to see the site of where the 2018 Winter Olympics will take place. The city is called Pyeongchang and it’s beautiful! HUGE mountains covered in glistening white snow… ahhh! How picturesque! 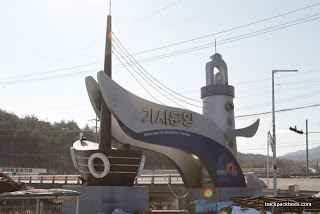 We passed some shopping outlets that I cannot wait to visit sometime soon, an ice fishing lake where we saw a few families ice fishing, a multitude of beautiful hotels and resorts, ski resorts, and of course the Seorak Mountains. We arrived at the rest-stop at around 9:30 AM a bit later than we expected. We grabbed coffee and a sweet potato latte and waited for the others to arrive. Once we were all there we got back on the road and traveled another hour or so until we reached Gisamun Harbor, where 38 Marine Resort is located and the guys had made diving arrangements at. A few miles up the road from the resort we passed a large statue of a mushroom mascot of Yangyang. Allen told us that the region is famous for its pine mushrooms that grow wild in the surrounding mountains. Pretty Interesting! This area is really popular for divers and surfers. You may remember Mr. B posting awhile back in the blog about the 38th parallel, well, that is where we were again. 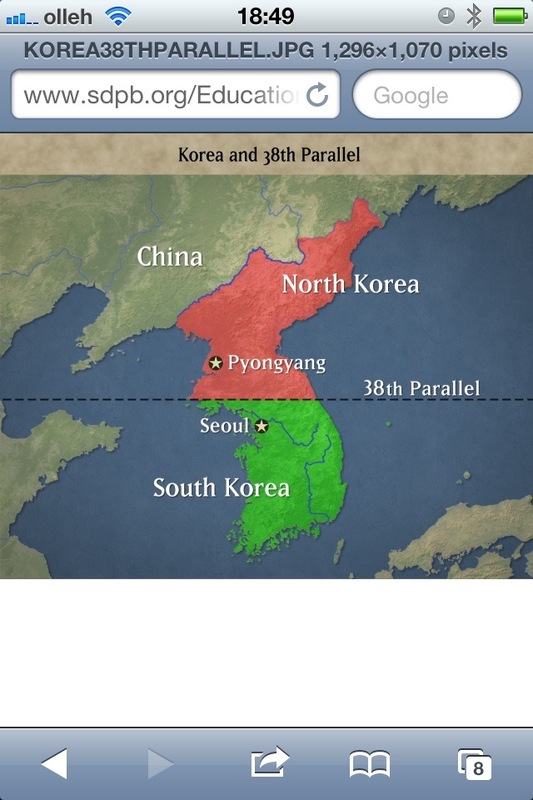 (Map picture taken off google search for 38th parallel). The guys all suited up and just like that they were loaded into the boat and gone. CRAZY! The temperature at the beach was ranging 23-32 degrees. Mr. B’s dive watch showed that the ocean water temperature was 49 degrees. I was beyond shocked to see so many surfers this time of the year. BRRRR!!! Much too cold for me! However, I am a HUGE chicken. I finished my book while we were there, took a stroll on the beach and checked out the local harbor area, snapped pictures, watched the waves divers and surfers. I really just enjoyed the peace and calmness that the beach gave off even more so in the winter. As far as the typical beach goer, I think i was the only crazy hanging around. The guys got in 4 dives the first day. Mr. B was ecstatic! I worried about him being too cold, he was the only nutty one in the group with a wetsuit and not a dry one. He said he was a bit cold but not as much as he expected himself to be. Those words made me feel a little better about the whole dive. The guys worked up quite an appetite after the diving. We quickly found our hotel, thanks to Allen, threw our stuff in our rooms, and piled into one car to go get some good eats. We went to a typical Korean BBQ restaurant located in the city of Gangneung . The food was outstanding! Really, what BBQ place isn’t? Never a letdown! We had pork jowl marinated in soy sauce and samgyupsal (pork belly). We also ordered and shared a nice big bowl of spicy beef and fresh vegetable soup with egg and glass noodles. DELISH! I seriously could eat Korean foods every day. After dinner we went for desert at Baskin Robbins. The location was perfect, sitting right around the corner. We each enjoyed a nice scoop of heaven and then swung by the Family Mart to pick up breakfast for the next morning. We got back on the road and checked in to our Korean hotel. We took some pictures to share with everyone. The place was brand new and get this it only cost us 50,000 won because the guys are Scuba divers! Yes! That’s almost like saying $50.00 US dollars for a night’s stay. I guess the Scuba diving card comes in handy! The rate without the scuba card was 80,000 won, still not bad at all. Once we got back the guys hung out a bit and tried on Mr. B’s new dry suit. It wasn’t too long before we all were tired and decided to retire to our rooms and go to sleep. The next morning we got up and meet at 8 AM. The sun coming up over the ocean was just beautiful! I snapped some pictures. When I was out on the balcony just about to go back into our room I heard what sounded like a cameras shutter opening and closing, Louis! Larry’s dive buddy Louis had seized the same opportunity to snap some quick pictures of the sun coming up so beautifully over the ocean and snow covered fields. The guys wanted to get in two more dives today and that is exactly what they did. Another wonderful adventurous weekend to mark in the books! So, how was your weekend? Would you be crazy enough to scuba dive in January? ?